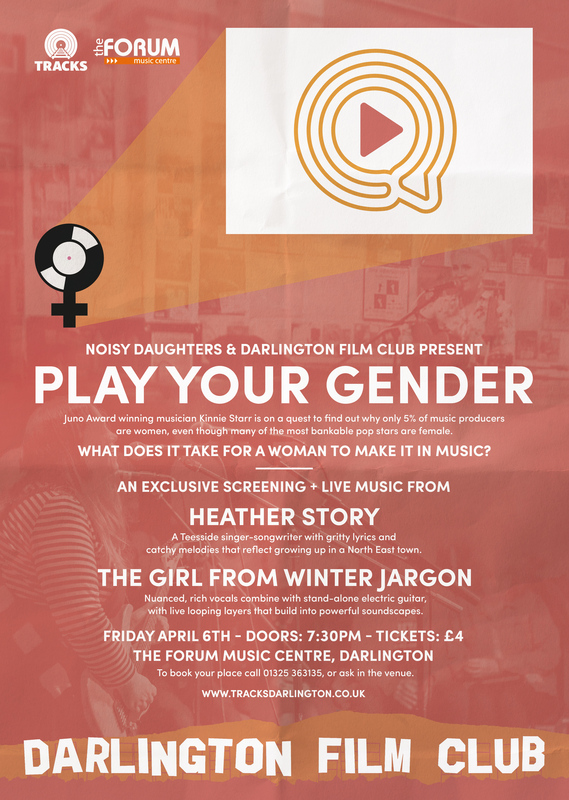 We're back with another Noisy Daughters event, this time teaming up with Darlington Film Club to bring you an exclusive North-East screening of the award winning documentary film 'Play Your Gender'. Juno Award-winning musician Kinnie Starr is on a quest to find out why only 5% of music producers are women, even though many of the most bankable pop stars are female. What does it take for a woman to make it in music? The documentary features insightful chats with Sara Quinn of Tegan & Sara, Melissa Auf der Maur of The Smashing Pumpkins and Hole, Patty Schemel of Hole, Chantal Kreviazuk, and many more of the music industry’s most talented women. Heather Story - A Teesside singer-songwriter with gritty lyrics and catchy melodies that reflect growing up in a North East town. Girl From Winter Jargon - Nuanced, rich vocals combine with stand-alone electric guitar, with live looping layers that build into powerful soundscapes. We hope the night can offer a creative, social way to highlight, examine, and discuss solutions to issues facing females in the music industry today, whilst also being a good night out. Tickets are £4 available from The Forum Music Centre. To book call 01325 363135.